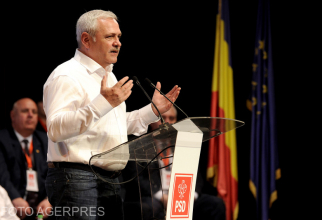 Un europarlamentar PSD o denigrează pe Laura Codruța Kovesi la Bruxelles. Scrisoarea trimisă de acesta a fostdată publicității de europarlamentarul Cristian Preda. În acestă scrisoare, PSD susține că Laura Codruta Kovesi are „18 dosare penale”. Europarlamentarul PSD Emilian Pavel a trimis Parlamentului European un email cu informații neadevărate despre Laura Codruța Kovesi, pentru a bloca numirea acesteia la șefia Parchetului european. „Ce nu se stie este ca doamna Kovesi este subiectul a nu mai putin de 18 dosare penale. 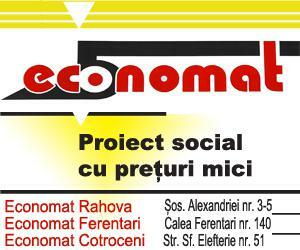 Inspectia Judiciara a confirmat ieri acest numar. Acuzatiile impotriva doameni Kovesi privesc intimidarea judecatorilor, procurorilor, martorilor si a avocatilor pentru a forta obtinerea de denunturi si chiar coruptie. (…) Cred cu tarie ca numirea doamnei Kovesi in fruntea Parchetului European reprezinta un pericol foarte mare de a implementa metodele ei abuzive la nivel european”, sustine Emilian Pavel, care adauga ca Laura Codruta Kovesi este suspecta de „coruptie”. „Zoaie pesediste in capul unei romance respectate in intreaga Europa…”, a comentat Cristian Preda scrisoarea lui Emilian Pavel. “Recently, it has been reported that Mrs. Laura Codruta Kovesi, the former chief prosecutor of Romania’s anti-corruption agency (DNA), is ranked first among three candidates shortlisted for the position of the first-ever chief prosecutor of the European Prosecutor’s Office (EPPO). On this occasion, I would also like to remind you that Romania was among the first EU Member States to adhere at the EPPO. What was not reported however is the fact that Mrs. Kovesi is at this point subject to no less than 18 cases of criminal prosecution investigating crimes committed by the justice system. The Romanian Judiciary Inspection officially confirmed the number yesterday. The charges against Mrs. Kovesi stretch from the intimidation of judges, prosecutors, witnesses, and lawyers, to forcing denounces, manufacturing half-truths and facts, and even corruption! Mrs. Kovesi was dismissed from DNA last year, following a decision of the Romanian Constitutional Court, and following a very long string of documented abuses by her and the prosecutors under her authority during the last six years. I have already sent you ample information about this in a previous e-mail. I strongly believe that, should Mrs. Kovesi be appointed as chief prosecutor of the EPPO, there is a clear danger that she will merely implement her documented abusive methods at a European level! These methods, I repeat, include intimidation of judges, prosecutors, witnesses, and lawyers, forcing denounces, manufacturing half-truths and facts, and even corruption. In too many cases, her, or her prosecutors’ indictments were rejected by the Courts as non-existent! In the recent years, Mrs. Kovesi created a cleverly crafted media campaign – which includes both postponing criminal prosecutions for corruption charges against media outlets that promote her (and whom were proven guilty by the Courts after her departure!! ), but also pressing fake charges against the media who didn’t support her (and whom were recently proven not guilty by the Courts!). 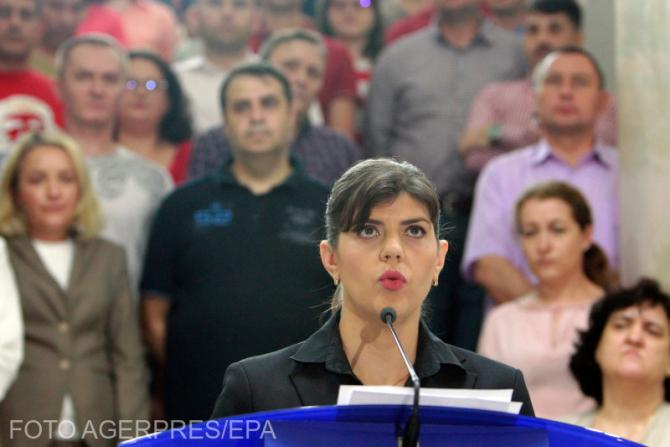 Mrs. Kovesi has created for herself the image of a justice crusader and, even more dangerously, as a person without whom justice in Romania cannot be done. By any standard or measurement, justice in Romania has been done long before Mrs. Kovesi’s stellar career and, since 2006 (! ), despite of it. 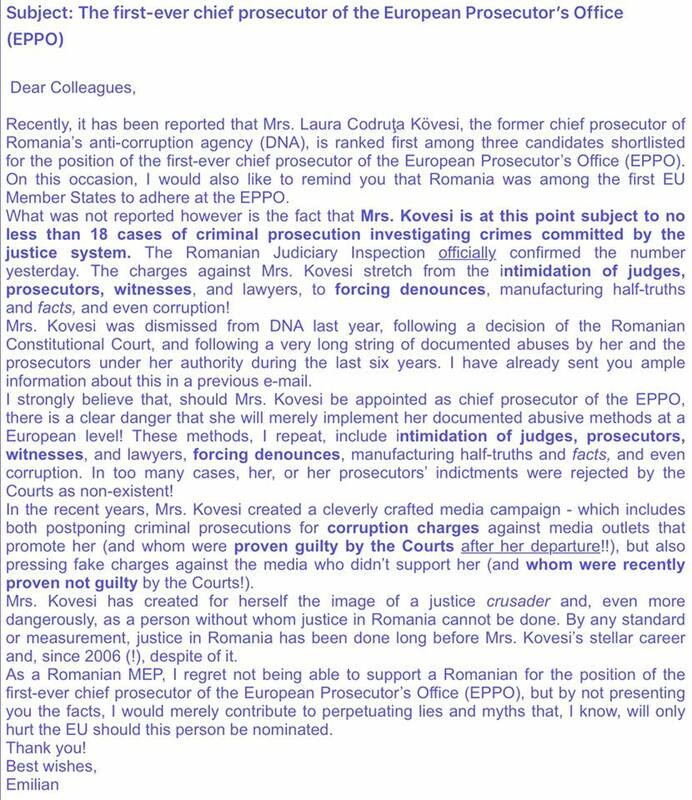 As a Romanian MEP, I regret not being able to support a Romanian for the position of the first-ever chief prosecutor of the European Prosecutor’s Office (EPPO), but by not presenting you the facts, I would merely contribute to perpetuating lies and myths that, I know, will only hurt the EU should this person be nominated.